Exterior of theater where the Viet Minh battled the French on November 20, 1946. 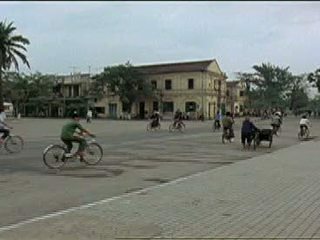 Chicago: “Vietnam: A Television History; City Square in Haiphong,” 02/14/1981, WGBH Media Library & Archives, accessed April 25, 2019, http://openvault.wgbh.org/catalog/V_6DC4CF3B19B1468AB607EB45FA915F97. MLA: “Vietnam: A Television History; City Square in Haiphong.” 02/14/1981. WGBH Media Library & Archives. Web. April 25, 2019. <http://openvault.wgbh.org/catalog/V_6DC4CF3B19B1468AB607EB45FA915F97>.